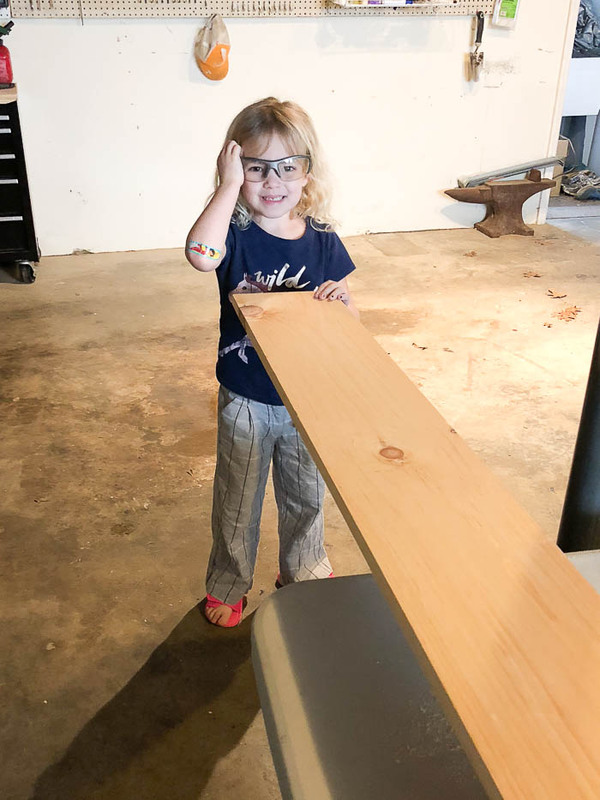 This project has only been completed for a month or so and I can already confidently say that it is hands-down the Circus’ most favorite thing I’ve ever made her – a wall mounted drop down desk. Y’all, she is at this desk everyday. In fact, before I could even get photos of it, I had to give it a good wipe down because she’d already gotten marker ink and glue on it from her various art projects. And from a mama’s point of view, it is so nice to have all her art supplies (sans paint because we ain’t letting her run wild with paint just yet) in one place. And to be able to just close it all up and hide the mess is the icing on the cake. 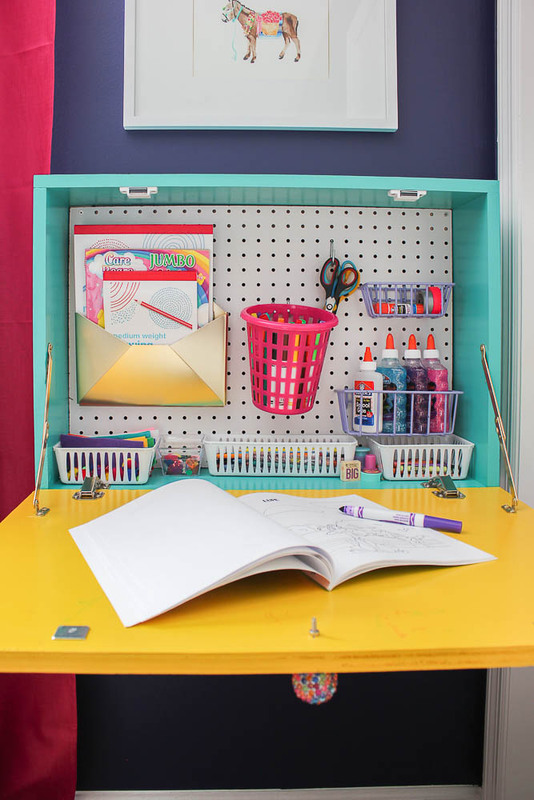 This DIY drop down desk can easily be made to work for both kids and adults. For adults, you’ll just want to raise up the mounting height a bit and possibly increase the overall size of the desk. For me though, even as an adult the size is more than adequate. 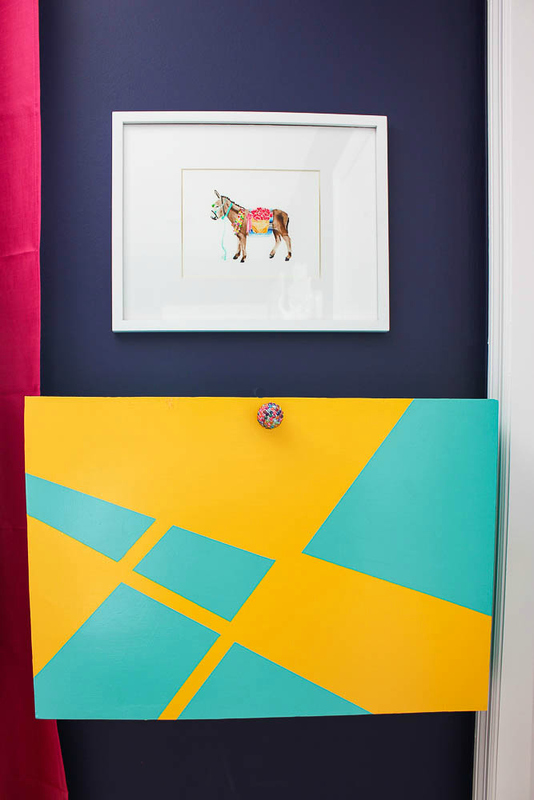 Paint Colors of Your Choice – The Circus chose Tropical Sea and Yellow Groove. We got sample pots of each and those covered our entire desk. 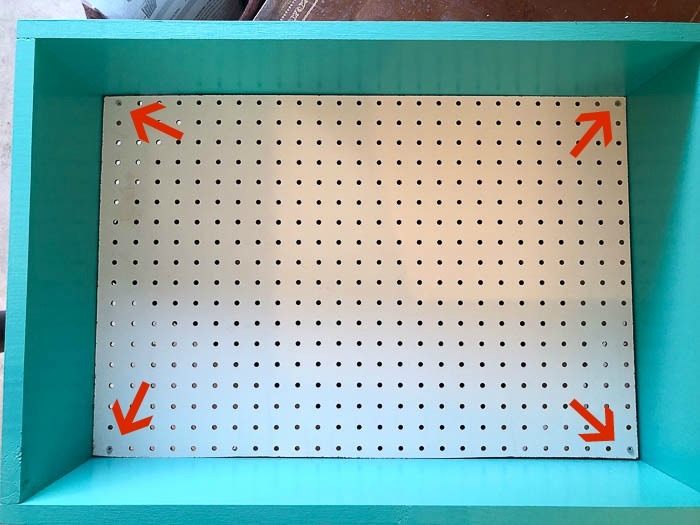 We also spray painted the pegboard baskets with this French Lilac color. Wood Screws – around 1 1/2″ – 2″ long and about 15 total. Wood Screws – around 3/4″ long and four total. Make the following cuts using either a miter saw or circular saw. 2. With the remaining 1″ x 8″ that is left, cut four small squares. These don’t have to be perfect at all. 3. 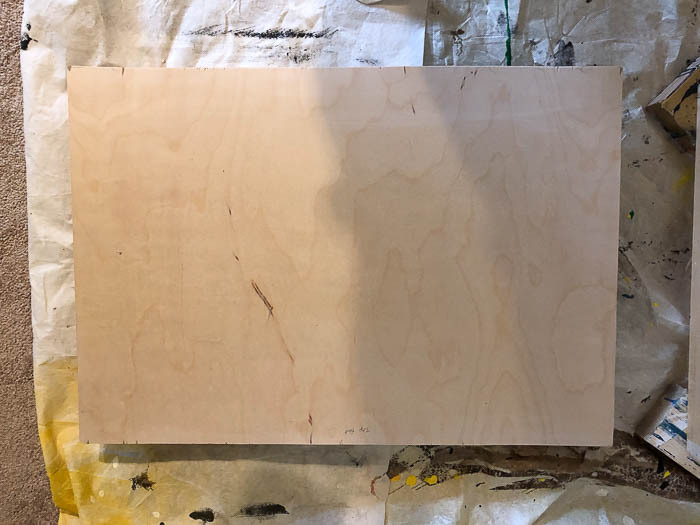 Using a circular saw, cut the 3/4″ plywood project panel down to 28″ x 19 1/2″. 4. 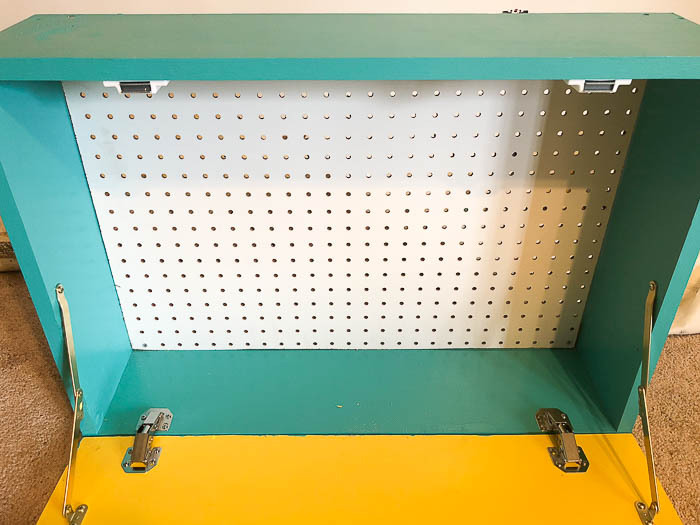 Using a circular saw, cut the pegboard project panel down to 26 3/8″ x 17 7/8″. 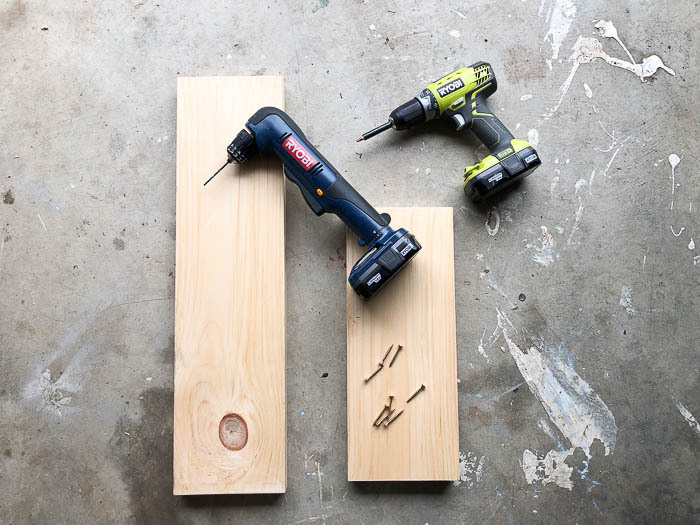 Gather your measured and cut four 1″ x 8″ pieces, drill and longer wood screws. Arrange the boards as shown below. Attach each longer 1″ x 8″ piece to each shorter 1″ x 8″ piece at the end of each board using two screws on each board. Drill a pilot hole first and then drill your screws in. 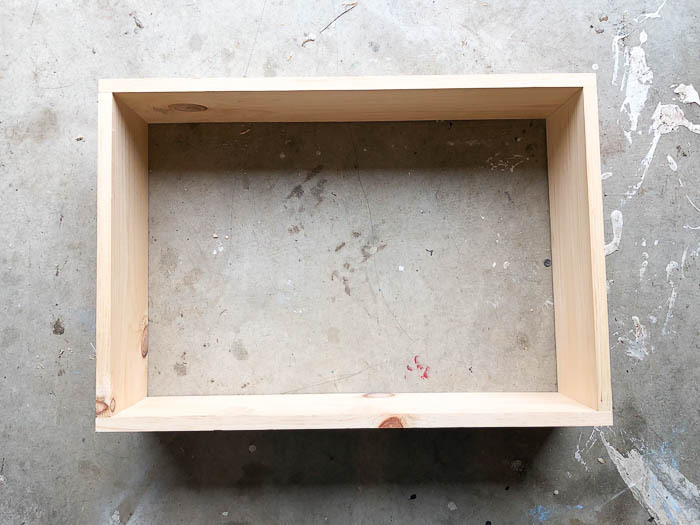 Lay your cut plywood panel on top of the 1″ x 8″ frame to make sure it fits properly. It should cover the entire frame. If you plan to paint your desk, go ahead and do so now. 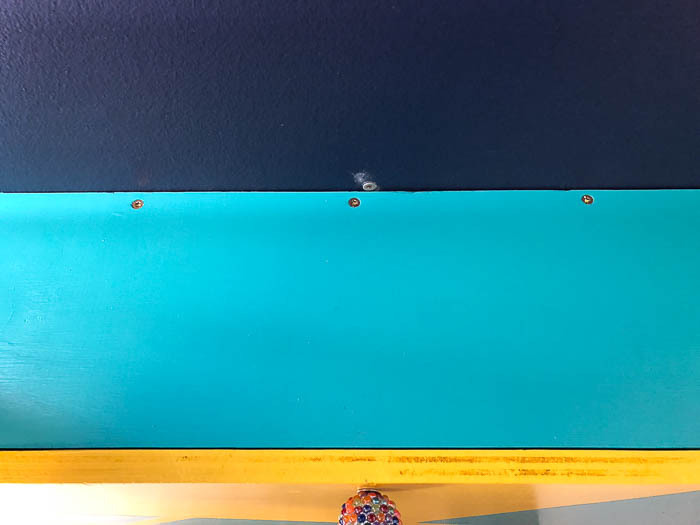 The Circus wanted two colors, so we painted the frame Tropical Sea and the drop down portion of the desk Yellow Groove. 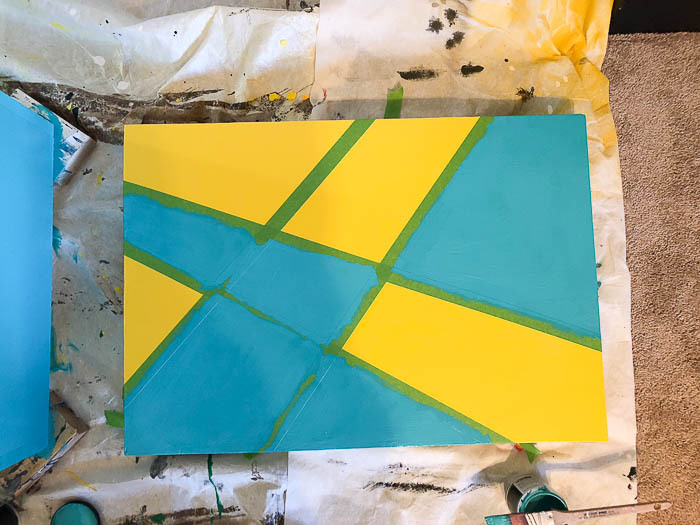 After the yellow was dry, she also made a design with tape to block off a few areas to paint the Tropical Sea on as well. 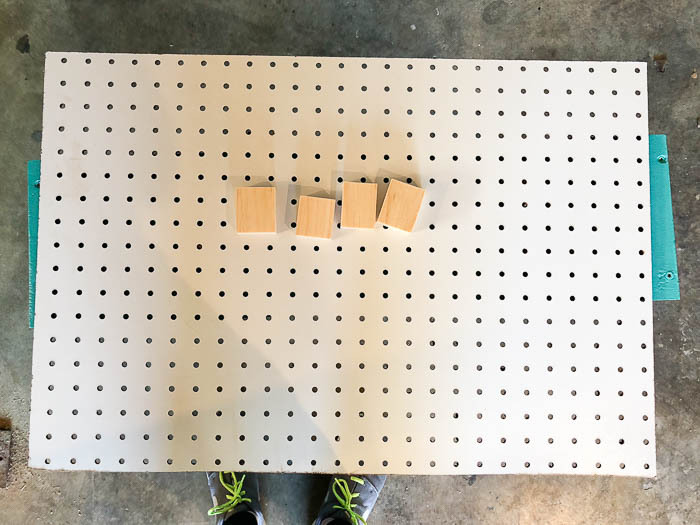 Get your cut piece of pegboard, the four small 1″ x 8″ square pieces you cut and the longer wood screws. 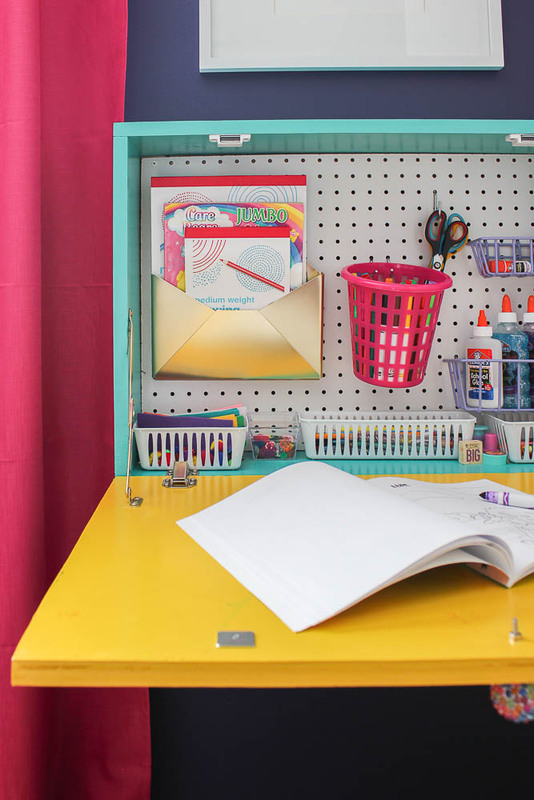 Place a square in each corner of the backside of the desk frame. 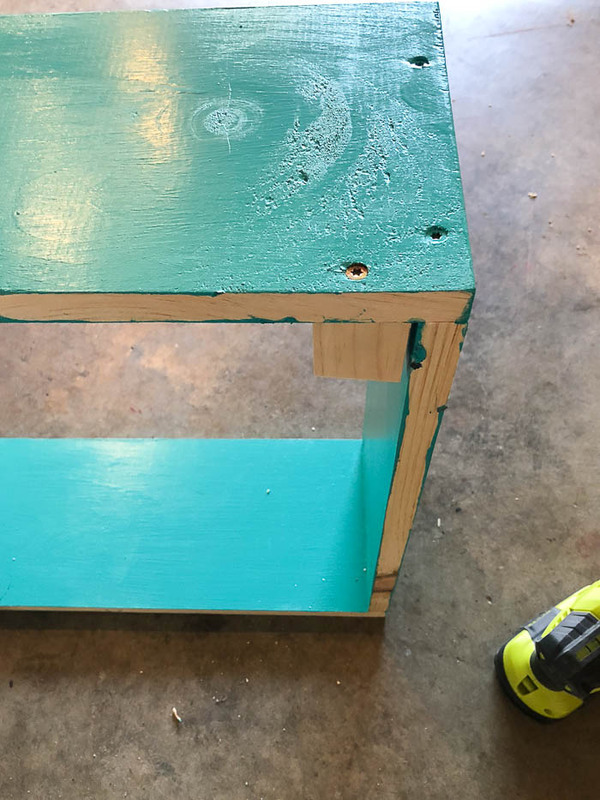 Drill a pilot hole and then fasten the square wood piece to the desk frame with one of your longer screws. 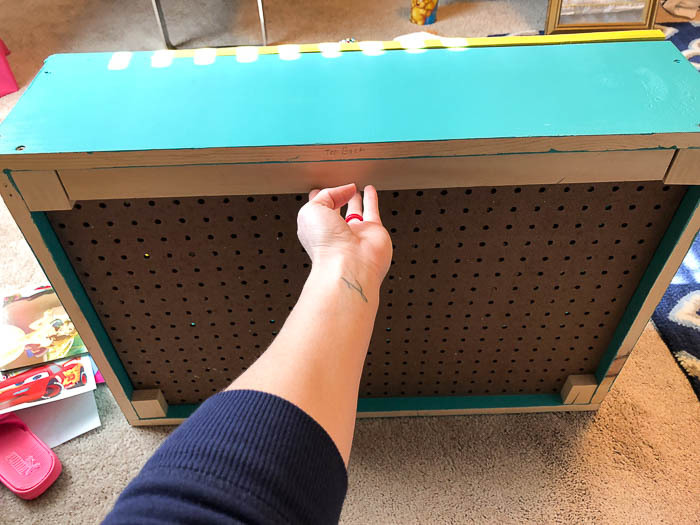 After you’ve attached all four wood pieces, place your cut pegboard piece through the front of the desk frame and attach it to each wood square using a smaller wood screw. Lay your drop down desk front on it’s face directly in front of the desk frame. Attach the frame and desk front together by using the 90 degree surface hinges. Get both your left hand lid support hinges and your right hand lid support hinges. Attach each following the package directions. An important thing to note here is that you might have to play with these right and left hinges a bit. For me, the lower portion that goes on the drop down front needed to be scooted in a bit more than what the package directions said (as you can see from my holes above!). This could vary from different brands of hinges. 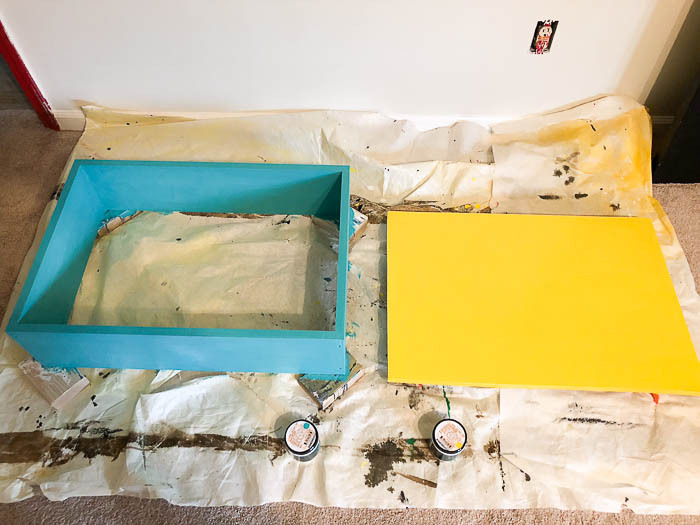 If you do have to play around with it and end up with a few holes, just fill with wood filler, sand and paint over them. 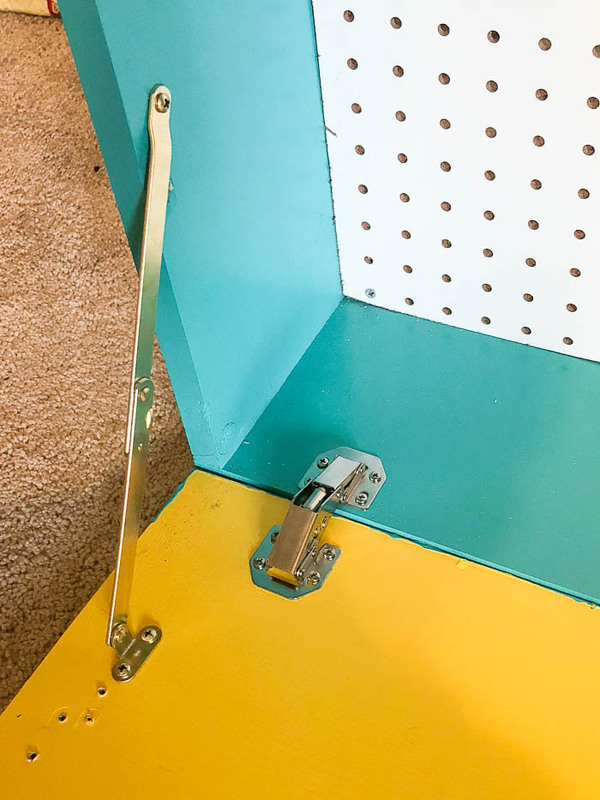 Attach the magnetic latches at the top of the drop-down desk frame and lid using the mounting instructions on the package. Attach whatever pretty knob you’ve decided to go with on the top front of your drop-down desk. 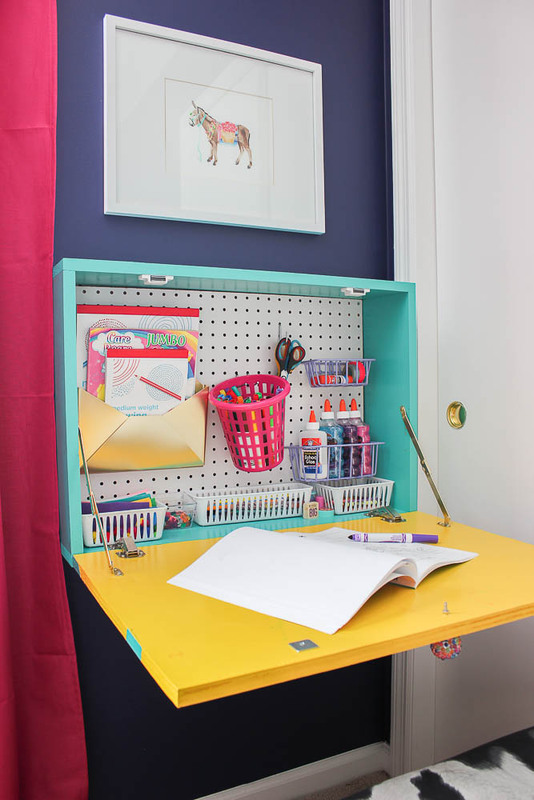 Determine where you want to hang your new DIY drop down desk. To do this, I had the Circus sit on the seat I knew she would be using at the desk and then held the desk up to see where it would be best to hang it for her. Make a mark on the wall where you want it to hang. Grab a stud finder and mark all the studs in that area. On the back of the desk, measure the area between the top two wood squares you attached in the corners. Cut your 1″ x 2″ furring strip to that length or slightly less than. 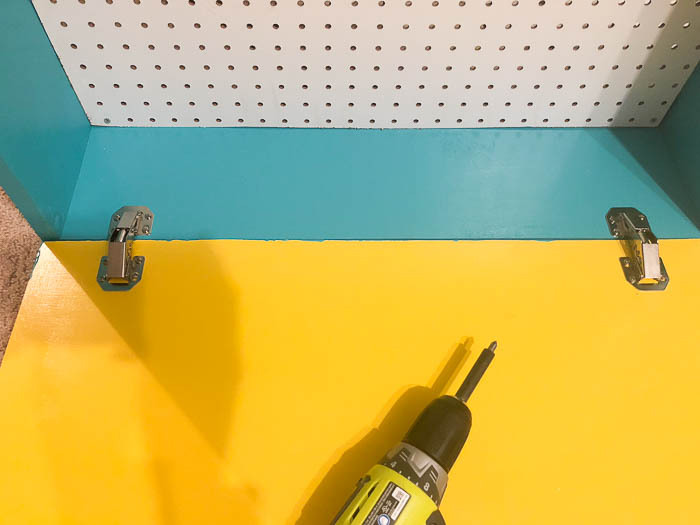 Place the furring strip on the wall and attach it to the wall where studs are using your drill and the longer wood screws. Use a level to check for levelness before placing the second screw into the furring strip and wall. Place the drop down desk on top of the furring strip. 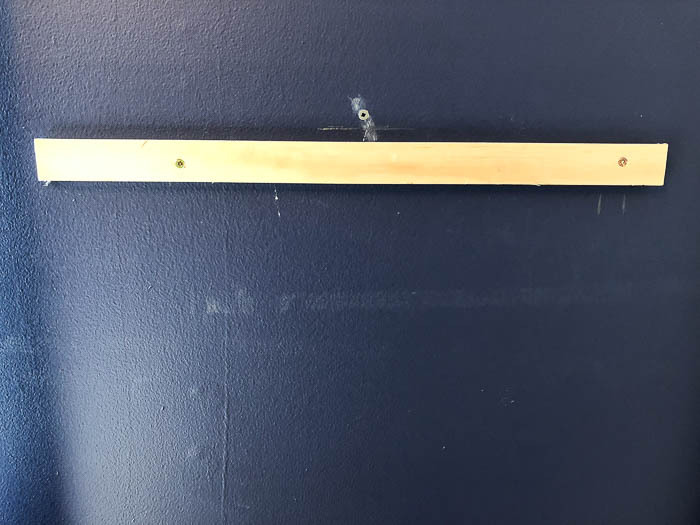 Using your longer wood screws, attach the desk to the furring strip you just attached to the wall. I put three screws along the back of our desk top as shown below. Drop it down and enjoy! She absolutely loves this thing. 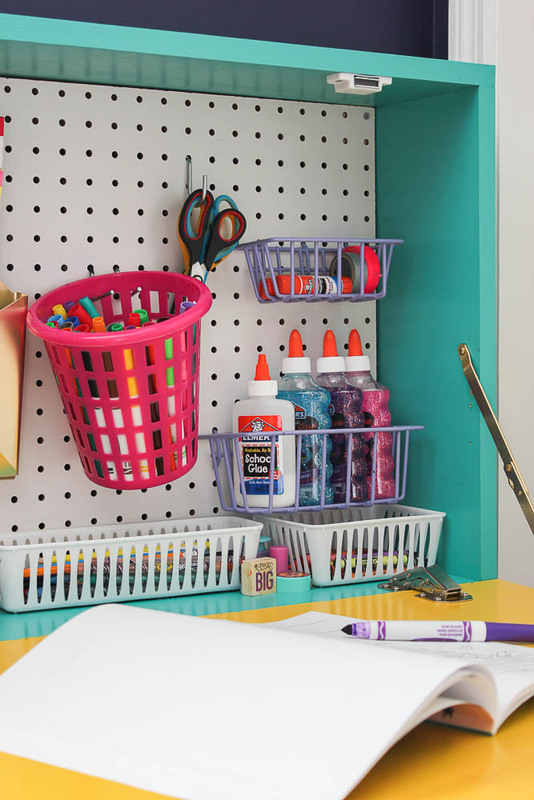 We used pegboard hooks to organize and hang most of her art supplies. The two purple baskets are part of this set of pegboard baskets that we spray painted. The other baskets are from the Dollar Tree. The gold organizer is from Target and holds a few coloring and drawing books. We also placed a few other Dollar Tree baskets along the bottom to hold colored pencils, crayons and random other art supplies. Hands down, this wall mounted drop down desk is the best thing I’ve built for the kid so far! Ooooo, it’s super cute! I love it! hahahahaha!!! I know, I know, I know! Parents are such downers. Grandparents let them have all the fun! Adorable and perfect for Circus!!! Promoting creativity and neatness!!! YES!!! Mom win on both counts!! Now you need to design some way for her to display her artwork where she can change the artwork by herself – great way to decorate her room or some other part of the house. Thanks, Susan! We were just talking the other day about how we need to throw up some string and clothespins and let her hang her work from it! You must be reading our minds! Wonderful and useful, and isn’t the Circus just adorable sitting there working! Thanks, Patty! She loves it and yep, she is pretty adorable! 😉 I’m partial of course, though! I saw the bottom picture of her and thought what a great idea for the buddy artist. Had been thinking of you and was going to email. I got a job for my news. Going well. Oh awesome, Stephanie!! So glad you got a job!! Yay!! Super cute and great idea! My daughter keeps her desk an ongoing disaster so I’d love to hide it away! Visiting from Made By You Monday party. Thanks, Victoria! Yep, I love being able to close up the lid on all that creativity going on! Amazing! My daughter would love one as well. 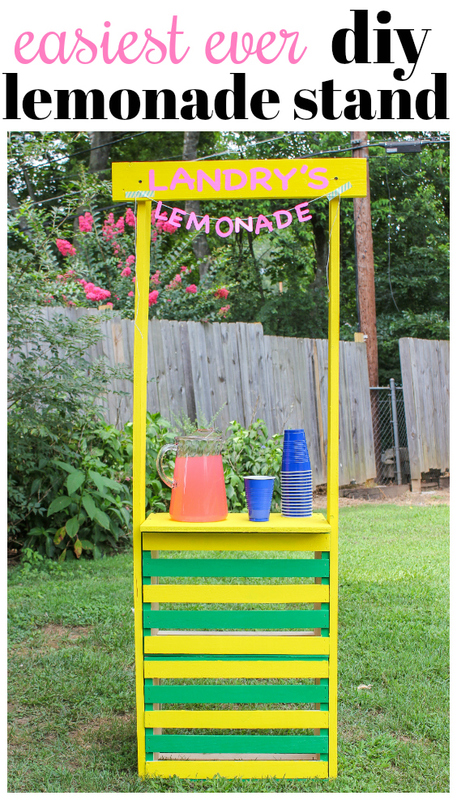 Thank you for sharing at the To Grandma’s House We Go DIY, Crafts, Recipes and More link party! Pinned! This turned out so cute. Lovely DIY. Thanks for sharing @DearCreatives Inspiration Spotlight party. See you again soon. pinned, and sharing. What a neat idea!! What a lovely little area to be creative! So functional! Thanks for sharing at Home Sweet Home! This is awesome! 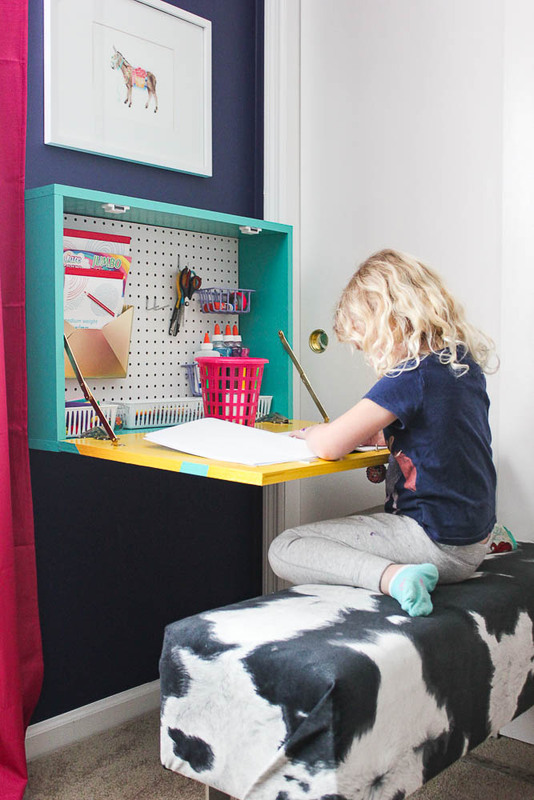 What a great way to provide a desk for a kid–or for an adult, actually! Thank you for the detailed instructions. Hmmm, maybe $50 or so. I don’t think it was more than that! Wonderful project. You show that DIY doesn’t have to be complicated. This could also be a good project for a Kitchen, just enough to make notes, not a whole ‘office’. I see a stained wood piece with polyurethane for easy cleanup, maybe something ‘found’ for the knob? You are totally right, Kathy! It would also be great for a kitchen!